December and January are the outdoor months in Kolkata-- book fair, leather fair, expo or textile fair, circus performances, various open air concerts and many more interesting outdoor stuff happen all over the city. So does innumerable picnics, either in private bungalows or in public spaces like the Zoological or Botanical Gardens, Victoria Memorial, on the banks of the Hoogly River or in the newly sprung up amusement parks. 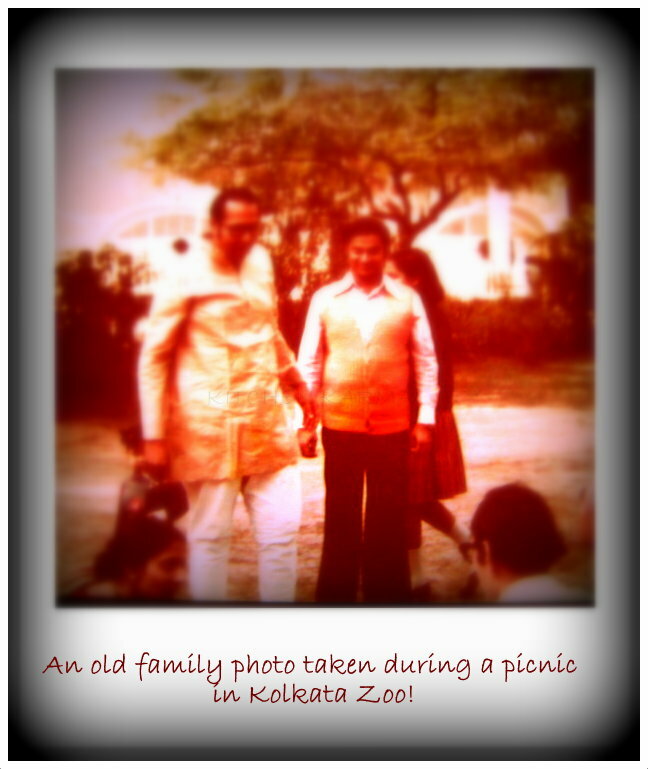 If nothing can be organised the enterprising Bengalis have picnics in their own backyard or terrace! Very near the Tropic of Cancer, Kolkata mostly has an extremely hot and humid climate. But by mid September incessant monsoon rains come to an end, almost like someone turning off a tap, and autumn valiantly tries to make an entrance. There is a nip in the air, the ceiling fan at maximum speed makes one shiver at night and trees start shedding leaves. By December the weather turns slightly chilly and Kolkatans happily step outdoors to enjoy the two months of mild winter. Warm clothes come out of trunks, smelling of moth balls, so does quilts and blankets which laid out in the terraces to 'sun' (In Bengali language rod khawa/rod dewa is a commonly used term meaning what in English would be 'to air'). Indians from the chillier North scoff at these elaborate preparations for a winter which never actually arrives. True the temperature hardly ever dips below 10 degree Celsius. But the Bengalis in Bengal do take their winter preparations rather seriously. The Bong heart shivers in anticipation of the chilling Himalayan wind sweeping the great Gangetic plain. You never know, the Bong logics, sometimes it does snow in Darjeeling and the distance between Darjeeling and Kolkata is a mere 634 kms, so what if the cold wave hits the plains? No Bong wants to be caught unprepared for that cold eventuality. Hence all those woollen sweaters, mufflers, socks, gloves which their mamas have laboriously knit through previous winter seasons. Winter heralds fresh seasonal vegetables in the markets like carrots, radishes, beet roots, various kinds of beans, spinach and other greens, cauliflowers, cabbages and best of all the oranges. Oranges from the North and West India start flocking markets of Kolkata from early December. Ah that smell of peeling oranges on lazy winter afternoons. This is also the favourite season for pickling. So ladies of the house spend their winter afternoons drying their wet hair in the sunny terraces, while guarding big glass jars of pickles and baris (lentil mixture with spices) which are left to dry in the sun (whereby it becomes hard and can be stored for a year or so in cool, dry places and are used in preparing many vegetarian dishes). This is in complete contrast to the summer months. During the summer, post lunch is siesta time in shutter drawn bedrooms. 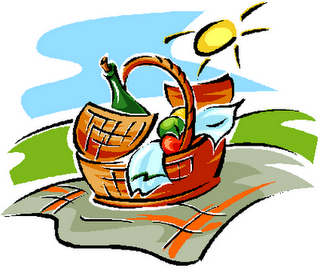 I vividly remember the picnics we used to go to when I was a child. Winter meant at least three to four picnics. A couple at my grandfather's garden house (20 kms away from the city) and the rest in public spaces like the Zoo and Victoria Memorial. The picnics held in the garden house meant the whole extended family, about 40 to 50 of us. Dates for the picnic would be discussed since Durga Pujo (in autumn) and eventually a date would be fixed. Then menus would be discussed. Some would suggest pot luck, mostly the ladies of the family would enthusiastically start discussing menus. Sometimes they would protest and say they need a break too! That would trigger discussions about hiring a professional cook or some enterprising uncle would suggest that he would cook. Then they would get into boring adult talk like who would hire the cook, who would be the grocery shopping et al. I remember the excitement mounting as the day of the picnic drew near. We the youngsters would discuss and plan the games we would play. Just to be on the safe side we would pack in everything-- badminton rackets, cricket kit, footballs, playing cards, Ludo board, Scrabble board, Frisbee, the boots of the cars would resemble a toy shop. On the morning of the picnic, we would plan to start early, but inevitably someone would get delayed, so after a spate of phone calls, a later time would be fixed. All the uncles and aunts would get their own cars and assemble in front of our house. We would try to accommodate our favourite cousins or sneak into their car. And wait patiently, while the elders sorted themselves. Finally the ten/twelve cars after one last discussion about the route (even though they all have been driving to the same house more than a couple of times every year) would snake out in a file. There would be some mad waving to each other and then enticing the drivers (usually the dads) to overtake all the others. Most often than not a car or two would get caught in the traffic, then all the other cars would pull up and wait for that car to catch up. We would stop midway for breakfast in some sweet shop. Breakfast would be luchi, torkari, boode ar cha (Indian fried bread, a potato curry, a sweet and tea) and then we would go off again. Or we would have breakfast once we reached the venue. In that case breakfast would be luchi/paratha (Indian fried breads) and aloo ur dom (potato cooked with spices) carried in steel tiffin boxes. Of course accompanied by tea poured from a big Thermos flask and some sweet. Bengalis learned to make aloo ur dom from the Kashmiris who had perfected the art of making Dum Aloo. But Bengalis being Bengalis, the enterprising foodies that they are, they have given Kashmiri dum aloo a thousand different avatars. There are literally umpteen varieties of aloo ur dom out there, each chef having his/her special recipe. After the meat and the fish, it is one of the most popular dish in Bengal. Every time you expect guests you make a gor gore aloo ur dom (really spicy potato). It is a must for picnics since it has no gravy, also for train travels. To go with it you need luchi or paratha, again dry stuff. But no Bengali would contemplate eating rotis, the healthier bread on such events. Today I want to share with you an aloo ur dom recipe which my mother often makes during winter. You could call it one of her specials. She usually serves it with motor shuti ir kochuri/stuffed peas puris. this has accompanied us to many a picnics, train journeys etc. This recipe has two parts. First let us make the coriander paste/chutney. Method: Just blitz all the ingredients in your blender, check the taste. This recipe yields a big bottle of chutney, if you do not have immediate use of so much, just store the rest in a sterilised glass bottle. The chutney stays fine in the fridge for about two weeks. Generally one bottle of this paste is needed for the aloo ur dom. Ingredients: 500 gms to 700 gms of small potatoes or medium sized potatoes halved, 90% boiled, if using an Indian pressure cooker one whistle should be sufficient. Once the potatoes have cooled down peel the skins and lightly prick them with a tooth pick. Method: In a big heavy bottomed pan (kadai) heat the oil, add the whole garam masalas, then add the haldi, coriander and cumin powder. Fry for a minute or so, then add the ginger paste, fry for a minute more, then add the poppy paste and the grated coconut. Fry till oil starts to separate, then add the coriander paste, mix well and let it come to a boil. Once everything has cooked, you will see oil separating at the sides, add the potatoes, again mix well and cover the pan with a lid and let it cook for about 20 mins, checking and stirring in between. If it gets too dry you may need to add a little water. Once the masala becomes dry and sticks to the potato after 20 mins or so, your aloo ur dom is ready. Check the salt, there was salt in the coriander and poppy paste, so you may need to add just a little more. Mix well. Once you switch off the heat add the roasted cumin powder and lime juice and your aloo ur dom is ready to be eaten. Serve it hot or cold with luchi/paratha/kochuris. I have nominated you for a Liebster award. Do stop by my blog to collect it!! Very delicious n nice way of making dum aloo,interesting recipe! Inviting and wonderful dum aloo !! Hi Suchi, how you doin'? You'd been busy lately? Thanks for sharing the Tales of Kolkata, I learn something new today. 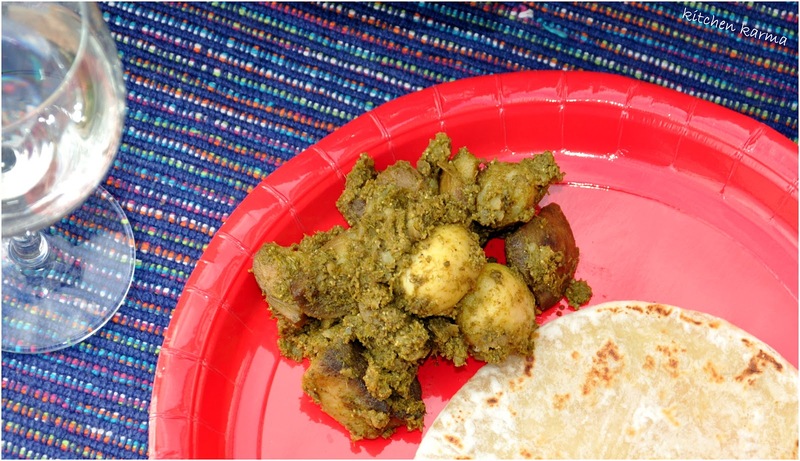 Your aloo ur dom look great, I suppose it should taste nice to go with any type of bread. Love the last picture, lovely and cute presentation. I love reading about the picnics of your childhood, and these dishes look amazing. Welcome to World on a Plate! I love how you are bringing back memories w/ this post. Love the recipe, too! loved the story - really took me back in time! Love this recipe .lovely blog and i found some more interesting recipes on your blog. Looks like so much fun Suchi :)Love your blog and always look forward to stopping by your Blog. I have fond memories of picnics from my childhood, too! But we never took such fabulous and exotic dishes...I'd be happy to join you on your next one! Your aloo ur dom looks delicious! 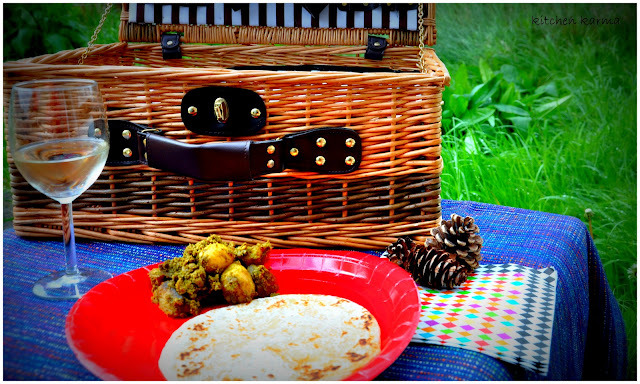 A dry style curry would definitely work better for picnics and travel. Just nostalgic...going down memory lane...don't know where these things are lost...just cherishing those old days when Luchi andf Aloor dom preparation from the morning for apicnic wud render pleasure of a life time...Thanks for rewinding those old memories and old time with these simple Bangla traditional food.